Fear crept into Prina's heart as she took in her surroundings. Before her stood thousands of tiny shacks, crammed tightly together in long rows. Large piles of garbage covered the same streets where children played. Accustomed to village life, Prina knew when she married Martin that moving to one of the largest cities in the country would bring change. But what she saw upon her arrival was nothing like what she had ever imagined. Prina married her husband when she was 18 years old and left her rural village and all that was familiar. She didn't realize that moving to the big city would mean living in one of Asia's many slums—Martin's childhood home. The depressing nature of the new surroundings intimidated Prina. Simple, everyday experiences in the slum were foreign to the young woman. To add to the culture shock, Prina faced a major barrier: She didn't speak the same dialect. When she found she couldn't communicate with anyone in the slum other than Martin, the young newlywed kept to herself inside their house, hidden away from the unfamiliar world around her. Martin, also known as Marty, was a believer when Prina married him. Through his example and the prayer meetings Marty hosted in their home, Prina also came to know the Lord. Then, after four years of marriage, Marty told his wife about his desire to attend a two-year Bible college. "I was not sad, but I was overcome by fear," Prina says. "I [was] still new to the city. I had my [oldest] son. I did not know how I was going to face the world and cope [with] the situation." With the help and encouragement of her in-laws, Prina said goodbye to Marty and sent him off to attend Bible college. Meanwhile, she and their son lived with Prina's mother for two years. When Marty graduated in 2006, God led him to stay in the slum where he grew up and start a GFA World-supported Bridge of Hope centre. Even though living in the slum was still somewhat foreign to Prina, she encouraged Marty to do what the Lord told him to do. "He was born and grew [up] in this place, and he knew the environment and life of those people," Prina explains. "So I encouraged him not to go elsewhere but [to] come back to the same area and do ministry." Nearly a decade later, their ministry has flourished. Now there are two Bridge of Hope centres and three churches led by GFA World-supported pastors in the slum where Marty and Prina's family lives. While she used to be afraid to leave her house, today Prina goes out into the slum with her husband and speaks to people about the love of Jesus. Marty is very supportive and encourages her often. "My wife plays a significant role in my ministry," Marty says. "Women are more open to listen to her than to me as a stranger. ... When she shares [about Christ's compassion], she becomes an icebreaker. She talks to them and we start building a little bit of relationship where we can share more about Jesus." Beginning ministry with her husband wasn't something Prina was prepared for, though. But then she started praying. "Lord," she prayed, "I do not know what my future holds. But definitely, if you want me to serve you among the women I surely am open to it, but You have to give me strength and energy." 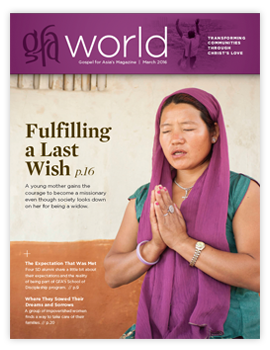 Now Prina leads a GFA World-supported Women's Fellowship. As Prina continues to help her husband in ministry, many times people ask her and the Women's Fellowship group for prayer. Before going to visit, Prina and the Women's Fellowship spend a whole day fasting and asking the Lord for guidance. Then they visit with and pray for the people, giving a listening ear to their problems and telling them about the hope found in Christ. "I am still not very confident in serving the Lord," Prina admits, "but somehow God has touched my life, and He is using me to do ministry among women." God's work in Prina's heart is evident through her acts of love and sacrifice. Christ has replaced her fear of the unknown with His love for the brokenhearted around her. "We don't want to leave this place. But tomorrow, if the Lord calls us to do ministry elsewhere, then definitely we are open to that call. It's all in God's hands," Prina says. Read about what it's like for Prina and Marty to raise their children in the slums. Living in the slums is no easy way of life, especially when it comes to parenting. But Marty and Prina are committed to raising their daughter and two sons to honour the Lord in spite of the negative surroundings. "There is always threat and danger for our children's character and upbringing if we are not careful," Prina says. "We don't allow our children to mingle with those who are not very disciplined. … We watch our children very keenly so that [they] don't go astray." Often the kids go with their parents for ministry in the slum, telling people how much Christ loves them. "The Lord's work is greatest among all works," says Marty, "so I am encouraging [our children] to do ministry." Their children learn by example how to serve the God who loves them, especially in the squalor of the slum. Both their sons and daughter desire to serve in ministry as they grow older. "We don't enjoy raising our children in this locality," Prina explains, "[but] the Lord has given [us] the ministry to work among the slum dwellers. … It's been our desire and prayer that our children, when they grow, they would follow and serve the Lord." Pastor Marty shares about life and ministry in one of South Asia's largest slums. Read Story. Four GFA World School of Discipleship alumni briefly share about their first impressions of the program. Read Story. A husband's dying words give a young mother the courage to become a missionary even though society looks down on her for being a widow. Read Story. A pastor's wife overcomes her fears of living in a South Asian slum. Read Story.